This book presents accounts of the practice of the person-centred approach with difficult client groups such as troubled adolescents, and people suffering from a range of severe and/or enduring conditions. Person-Centred Practice at the Difficult Edge comprehensively refutes the notion that person-centred therapy is suitable only for the ‘worried well’, and backs up contemporary practice with appropriate theory and evidence throughout. Intended for student, academic and professional readerships, it aims to help broaden the range of applications of person-centred practice and encourage interest in working with challenging client groups. Subject areas include Autism, adult survivors of childhood sexual abuse, dementia, learning disabilities, palliative care, Pre-Therapy, posttraumatic stress and posttraumatic growth, psychotic process, tenuous contact with adolescents, therapist limits. Pearce, P., & Sommerbeck, L. (2014). 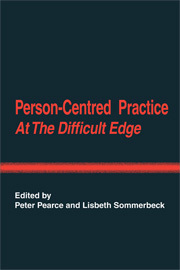 Person-Centered practice at the difficult edge. Ross-on-Wye, UK: PCCS.